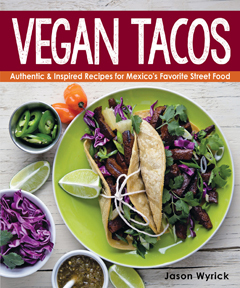 We’re happy to be able share a recipe from Jason Wyrick’s upcoming cookbook Vegan Tacos: Authentic & Inspired Recipes for Mexico’s Favorite Street Food with you today for Taco Tuesday! 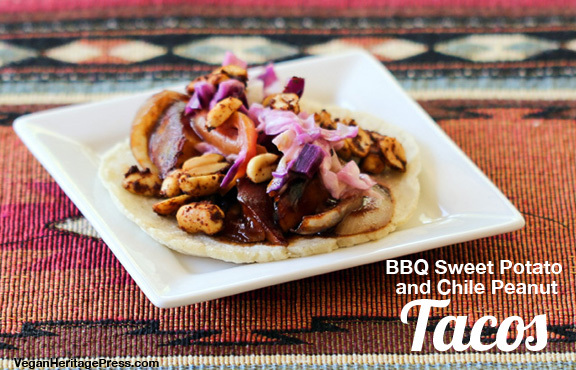 This recipe for BBQ Sweet Potato and Chile Peanut Tacos was inspired by the barbecue dishes Jason ate while living in Fort Worth, Texas. These tacos are messy, a bit decadent, but oh-so-tasty. If you want to up the heat level, add some minced serrano chiles to the top. Vegan Tacos was named one of the 15 Most Anticipated Vegan Cookbooks of 2015 by Colleen Holland from VegNews Magazine, and Jason Wyrick was recently named as one of the 5 Up and Coming Vegan Chefs Whose Names You Should Know by One Green Planet. Vegan Tacos is due to hit bookshelves on September 2nd is available for preorder from Amazon, Barnes and Noble, Powell’s, and bookstores everywhere. Heat the oil in a skillet over a medium-high heat. Add the onion and sauté until well browned, about 10 minutes. Add the sweet potatoes and enough water to come up about 1/2 inch up the pan. Cook the sweet potatoes until they are soft, about 8 minutes. You will need to replenish the water as it cooks down. Season with the salt and lower the heat to medium. In a bowl, combine the vegan mayo, garlic, lime juice, and salt. Toss the cabbage with this mix and set it aside. Warm the tortilla. Fill them with the BBQ sweet potatoes and onions, then the slaw, and top with chile peanuts.